Greetings! Can you believe that we are half-way into 2015?! We were blessed earlier this year to minister at Charis Bible College in Raleigh, North Carolina. Before we left on our journey, I (Sean) felt a simple impression by the Lord to not travel the shorter route but to take the longer route. So we heeded that still small voice and traveled via the longer route. After, we discovered that the route we would have taken had a snow storm blow through at the time we would have been on that route. The roads became very dangerous and the roads ended up being closed due to the storm. We don’t know if anything serious would have transpired if we had taken that route, but Praise God the route we felt led to take didn’t have one flake of snow the whole journey. We just want to encourage you to follow even the slightest leading. It very well could be the Lord saving you from something! Jeremiah, our youngest, turned 13! That word “grace” was translated from the Greek word “charis”. It was translated mainly as “grace” throughout the New Testament, but it was also translated as “favor”. If you are born again, you have Jesus and all that He is living on the inside of you. Because of that, you have both grace and truth resident on the inside of you in the person of Jesus. You also have favor! Grace and favor and truth come by and through Jesus. In other words, because Jesus lives on the inside of you, grace and favor is now something that FLOWS THROUGH YOU, not something that COMES TO YOU! If you would like to hear this message in more fullness, go to our website and check it out. It is called The Favor of God. Recently, we ministered at Perryville Family Church in Perryville, Missouri. Many were blessed by the Word that was ministered during the Sunday morning service. We also conducted a mini-healing seminar that Sunday evening. After the two sessions, we had the people in attendance lay hands on those who had various ailments. There were many testimonies of people being healed of issues that they had struggled with for years. This is great because we need the whole body to be ministers of the gospel, not just a few. I also ended up praying for a lady after the seminar who had a condition called neuropathy and all of its typical symptoms. She had numbness, lack of feeling, burning, etc., in her legs. She was healed as hands were laid on her. Praise God! 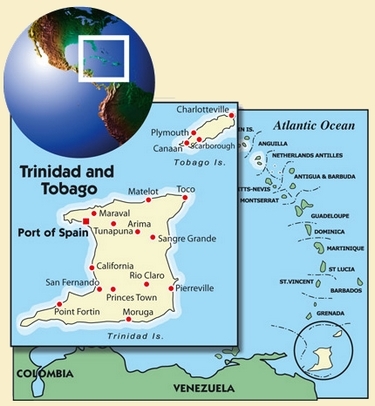 For five weeks during July and August, we will be ministering on the island of Trinidad. We will be ministering in many different churches and conducting healing seminars as well. The last time we were in Trinidad, I (Sean) got the opportunity to preach the Word on a radio program that covered the whole nation of Trinidad. We believe that more opportunities for the gospel will present itself during our time in Trinidad. Be praying with us about this great door of ministry. If you aren’t a partner, please consider becoming one. If the Lord has blessed you through this ministry, why don’t you become a part in seeing God bless others. It is very easy to become a partner, you can go to our website www.kemi-inc.org and click on the donations tab and follow the directions to donate. You can also send a check in the enclosed envelope. Thank you partners! It is great that we are working together for the furtherance of His Kingdom!